If a normal metal (N) is in good electrical contact with a superconductor (S), Cooper pairs can leak from S to N, modifying the properties of the metal, as depicted in the figure. This phenomenon, known as a proximity effect, was intensively studied in the 1960s [1,2], and there has been a renewed interest in the last two decades because of the possibility of studying this effect at much smaller length and energy scales .When a Cooper pair penetrates into a normal metal, via an Andreev reflection , it becomes a pair of time-reversed electron states that propagate coherently over a distance LC, which in diffusive metals depends on the diffusion constant, the energy of the electron states (with respect to the Fermi energy), and the phase-coherence length in N. This Cooper pair leakage modifies the local density of states (DOS) of the normal metal over a distance LC from the S-N interface. Such a modification has been spatially resolved in recent years with the help of tunneling probes [5,6] and with scanning tunneling microscopy/spectroscopy (STM/STS) techniques applied to mesoscopic systems [7–11]. 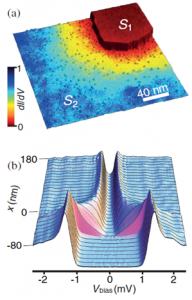 Very recently, the considerable progress in the controlled growth of atomically clean materials under ultrahigh vacuum conditions has made it possible to probe the proximity effect with high spatial and energy resolution in in situ STM/STS experiments [12,13]. The proximity effect is not exclusive of S-N systems. If a superconductor S1, with a critical temperature TC1 and energy gap Δ1, is brought into contact with another superconductor S2 with a lower critical temperature TC2 < TC1 and energy gap Δ2 < Δ1, the local DOS of both superconductors near the interface is expected to be modified. At low enough temperature, T < TC2, this modification should be significant. Moreover, in the temperature range TC2 < T < TC1, one expects the proximity effect to induce a finite local order parameter in a formally non-superconducting S2, owing to a nonzero attractive pairing interaction λ2 existing in S2. Such a mechanism should result in a proximity-induced interface superconductivity. These remarkable effects were first discussed qualitatively by de Gennes and co-workers in the 1960s [1,2], but to the best of our knowledge, no experiment has ever been reported in which this peculiar S1-S2 proximity effect could be spatially resolved. Hereafter we describe two interesting proximity geometries we have recently explored. 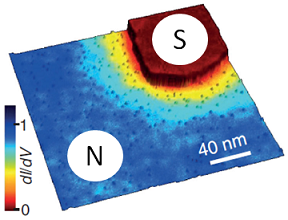 Proximity Effect in a Disordered Two-Dimensional Metal Revealed on Nanometer Scale. In this activity we explore experimentally and theoretically the proximity effect in a highly diffusive atomically thin metal. The samples are grown in situ by the deposition at room temperature of a few atomic layers of Pb onto an atomically clean 7x7 reconstructed surface of undoped Si(111). The topographic STM image shows in Fig. (a) the resulting Pb network that consists of atomically flat 7–13 ML thick single nanocrystals of Pb, interconnected by a 1–2MLthick wetting layer (WL) of Pb . In Fig. (b) the experimental geometry is sketched ; the regions of interest include the island edge and the neighboring part of the WL. The experiments were performed in ultrahigh vacuum P < 5x10-11 mbar, and mechanically sharpened Pt/Ir tips were used. In order to resolve fine spectroscopic features, the STM or STS experiments were conducted at 320 mK, i.e., at T/Tc=1/20 . Local tunneling conductance spectra dI/dV(V)(X,Y) were derived from the raw I(V)(X,Y) data. Our main finding is illustrated in Fig. (c) where we show the evolution of local dI/dV(V)(X,Y) spectra as a function of the distance from the island edge. The superconducting state in the islands is characterized by a fully opened gap dI/dV(V=0)=0 (bottom curve in Fig. (c)), which is spatially homogeneous over the island area (red-colored in the STS map Fig. 1(b)). On the WL side far from the islands, the zero-bias conductance is high, and the tunneling spectra in these regions exhibit a V-shaped dip at zero bias (ZBA) (upper curve in Fig. 1(c)). The absence of a clear gap is evidence of the intrinsic non-superconducting character of the WL. As the STM tip approaches the island edge, the tunneling spectra evolve gradually from the non-superconducting ZBA to the superconducting gap shape thus evidencing the proximity effect on a scale of several nanometers. In the vicinity of each superconducting island the wetting layer acquires specific tunneling characteristics which reflect the interplay between the proximity-induced superconductivity and the inherent electron correlations of this ultimate diffusive two-dimensional metal. The observed spatial evolution of the tunneling spectra is accounted for theoretically by combining the Usadel equations with the theory of dynamical Coulomb blockade  ; the relevant length and energy scales are extracted and found in agreement with available experimental data. Spatially Resolved Proximity Effect between Two Superconductors. In this activity, we perform a STM/STS study of the proximity effect in a lateral S1-S2 junction with a very high spatial and energy resolution, for temperatures well below and above TC2. The junction was laborated in situ in ultrahigh vacuum on Si(111) - Fig. (a). The S1 electrode is formed by a single nanocrystal of Pb (TC1 ≈ 6.2 K, Δ1 = 1.2 meV). S2 consists of a single atomic layer of Pb reconstructed on Si(111) to form the so-called striped incommensurate phase, a superconductor with TC2 ≈ 1.8 K and Δ2 = 0.23 meV. For temperatures well below TC2, we observe a pronounced modification of the local tunneling conductance spectra in S2 over a distance of around 100 nm from the S1-S2 interface - Fig. (b). Above TC2 but below TC1, the tunneling spectra in S2 exhibit an induced gap that extends to distances anomalously large for a normal metal. Our experimental observations are explained with the help of a one-dimensional model based on the Usadel equations, where the order parameter is evaluated self-consistently. Importantly, our combined experimental and theoretical study furnishes strong evidence that the long-range proximity effect observed in S2 above TC2 is a direct consequence of the appearance of proximity-induced interface superconductivity in the atomic monolayer (ML).